It’s coming! Weare only a month away from what is known as ‘Rock’s Loudest Month.’ However, in this case, it’s a month of loud spread across the sunshine state and we have your guide to road tripping to all the best shows that’ll up your mileage! 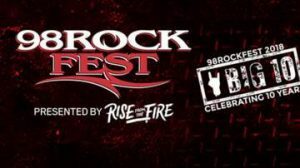 It all starts on Friday, April 20th at Amelie Arena with 98Rock Fests ‘Big 10’ concert. Boasting a great line-up consisting of Shinedown, Seether,Three Days Grace, Starset, Fozzy, 10 Years, Red, and more. Click here to purchase tickets for this arena titan! Take a trip with us the next day to the mammoth Central Florida Fair Grounds in Orlando to check out the 25th annual Earthday Birthday concert presented by WJRR. This show promises a long day of fun hard rock from Shinedown, Seether, Three Days Grace, Bush, All That Remains, Nonpoint, Starset, Fozzy, 10 Years, Red, Powerman 5000, Dead Girls Academy, and Nirvanna. This is a biggie as WJRR celebrates 25 years of this insane show! Now that you’ve taken a few days break you have two choices. Making a move from Ft. Myers to Markham Park in Ft. Lauderdale, Monster Energy Drinks Fort Rock Festival brings an intense line-up that South Florida has not seen in quite some time for a festival. Saturday, April 28th brings out the heaviness with Godsmack, Five Finger Death Punch, Shinedown, Halestorm, Bullet for my valentine, UnderOath, Trivium, Hatebreed, Bad Wolves, and More. Sunday, April 29th packs a punch with the king of metal, Ozzy Osbourne bringing his No More Tears 2 Farewell tour, Breaking Benjamin, Stone Sour, Stone Temple Pilots, Killswitch Engage, Hollywood Undead, Sevendust, Pop Evil, Red Sun Rising, Avatar and a slew more. A rare show like this, pick up your tickets here before they’re gone! If you’re on the other side of Florida however, you may want to pay a visit to Metropolitan Park in Jacksonville for Welcome to Rockville. This show just gets bigger and bigger every year as it’s now a 3-day extravaganza. Friday, April 27th – Ozzy Osbourne bringing his No More Tears 2 Farewell tour to the stage along with Godsmack, Five Finger Death Punch, Halestorm, The Used, UnderOath, Trivium, Atreyu, and more. Saturday, April 28th – A heavy hitting day headlined by Avenged Sevendfold with Breaking Benjamin, Stone Sour, Stone Temple Pilots,Black Veil Brides, Sevendust, Killswitch Engage, Asking Alexandria, and more. Sunday, April 29th – The show ends massively with Foo Fighters, Queens of the Stoneage, Billy Idol, Bullet for my Valentine, Clutch, Thrice, Quicksand, and more. Purchase your tickets fast for this one! ‘Where Music Meets the Waterfront,’ Sunfest isn’t just a tradition, it’s an institution of family fun/outdoor entertainment/concert experience. This year is no different with three stages strewn down Flagler that will have you smiling all day! Friday, May 4th – Incubus, Zedd, Nathaniel Ratcliff and the Night Sweats, Hell and Hollar, Brother Sundance, and more. Sunday, May 6th – Pitbull, Cake, Partynextdoor, Ari Lennox, Dnce, Third Eye Blind, Sublime with Rome, Lovely the Band, Sonali, and more. Click here to purchase a single day ticket or a a 4-day ticket you’ll need to pick up sunscreen for!